Ninkasi, Sumerian goddess of beer. Yesterday an article in the Food and Drink section of Huffington Post caught my eye: “According To History, We Can Thank Women For Beer.” It details the role of women in the invention and development of brewing going back at least 9,000 years. But it never answers the question that immediately arose in my mind – “Why did women invent beer?” Here’s my theory. snow blown sideways across the endless steppes. dragged themselves back to their bend in the river. roots, bugs, even the grasses the wild horses grazed. until the batch went bad, bubbling and stinking. worse – raw snails, rotted fish – he choked it down. and rolled around with the children in the dirt. gathering all the seed-heads she could find. none of them felt much inclined to take up the hunt. 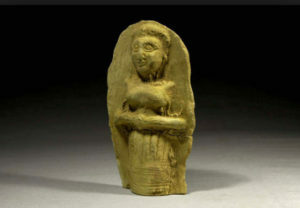 she was revered as Menqet. And the rest is history.